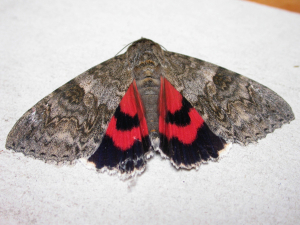 Observation - Red Underwing moth - UK and Ireland. Description: Brightly-coloured moth found dying in a garden shed. As this is a woodland species, and my shed is in an urban garden, I've no idea how it got there! Brightly-coloured moth found dying in a garden shed. As this is a woodland species, and my shed is in an urban garden, I've no idea how it got there!